Once or twice in your life, you might find yourself running short of space on your 16GB iPhone. Sometimes this happens because you have too many photos, videos, music files or texts stored in the iPhone. If you want to upgrade your device to a new iOS version, you will be required to free up space on your 16GB iPhone completely. When most people are caught up in such a situation, the first thing that comes in their mind is deleting apps, offloading photos and videos or even restoring the device to factory setting. When you want to free up space on 16GB iPhone, you can either choose to use software or not. The following are some of the techniques that you can apply in order to get that extra space on your iPhone XS/XS Plus/XR/X/8/8 Plus/7/6 without software. Before erasing, we suggest you transfer iPhone data to computer for backup firstly. One of the reasons why your iPhone is running out of space is because you are double-saving your pictures. This occurs to the people who frequently use their iPhone's HDR mode or Instagram. Photos occupy a lot of space on your device. Anytime they take a photo; the device saves the normal version and the HDR version or the cropped and the filtered one. 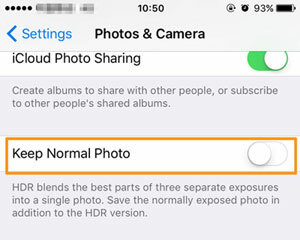 To stop your device from double-saving images, go to the settings app, photos and camera and disable the "Keep Normal Photo" toggle. On Instagram, open the app, go to your profile, tap the setting icon and disable the toggle that is right next to "save original photos". You will find yourself in this situation if you are used to storing your texts forever. iPhone devices have default settings of storing all the text messages that the users send and receive forever which is not convenient if you want to free up some space. However, if you are not in need of looking up an old conversation, you can change the setting by opening the settings app, tap on messages and change the "Forever" to the duration of your convenience which can either be thirty days or a year. A lot of people love music, and that is why they find themselves downloading too many playlists and albums on their iPhones. If your device is already running out of storage, you should consider deleting some of the downloaded music. All you need to do is to go to the settings app, open general, storage and icloud usage then to the manage storage icon. On the Apple music icon, you can either delete individual songs or all of them, just by swiping. With Spotify, it might be quite difficult to locate your downloads. However, you can open your library, view the music by album or playlist, add the downloads filter and choose the songs to delete from the ones listed. Most of the times, our devices might be storing web history and data that we don't even need. If you are using Safari, you can clear the cache by opening the settings app, tapping safari and then click on the "clear history and website data" icon right at the bottom. For the people who use chrome, the procedure is almost similar. Open the chrome app, click on the triple-dot button on the top right corner and clear the browsing data. 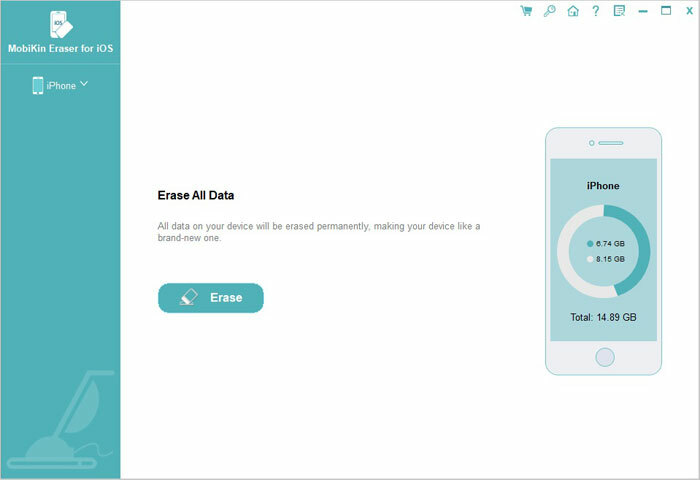 When you need to give away your old iPhone, improve your mobile phone performance, delete some private staff or get more storage space, you will be required to erase important information such as contacts, passwords, chatting records and bank accounts from the device to avoid them from being disclosed. The first thing that most users think of is restoring the iPhone device to factory setting. However, this process might not be easy if you have forgotten your password, and this also cannot erase data permanently. Good news is that there is the MobiKin Eraser for iOS that can help you complete the procedure with one click. MobiKin Eraser for iOS is one of the most effective eraser programs that allow an iPhone user to delete files, private data or system settings. Therefore, you can actually free up your 16GB iPhone under the help of this software. 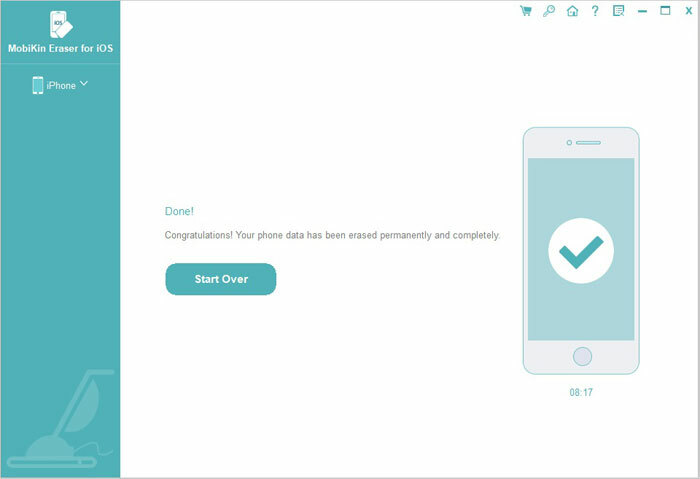 Unlike other professional programs with complex user interface, this software enables you to clear any unwanted files from iPhone within 1-2-3 step. All devices of iOS operating systems can be perfectly compatible such as iPhone, iPad and iPod. Want to know more about this software? The following are the steps you need to develop. Just download the free trial version of the Eraser for iOS by clicking the below icon to give it a try! Step 1. To connect the 16 GB iPhone to your personal computer, you will need to use a USB cable. The MobiKin Eraser for iOS will automatically detect the connected iDevice. Step 2. After the connection, you can tap on "Erase" button on the interface. After that, click on "Medium", which would bring up the "Select Security Level" window. Step 3. Now, choose the right erasing mode according to your need and you need to type in "Delete" in the input box. Finally, tap on "Erase" button. 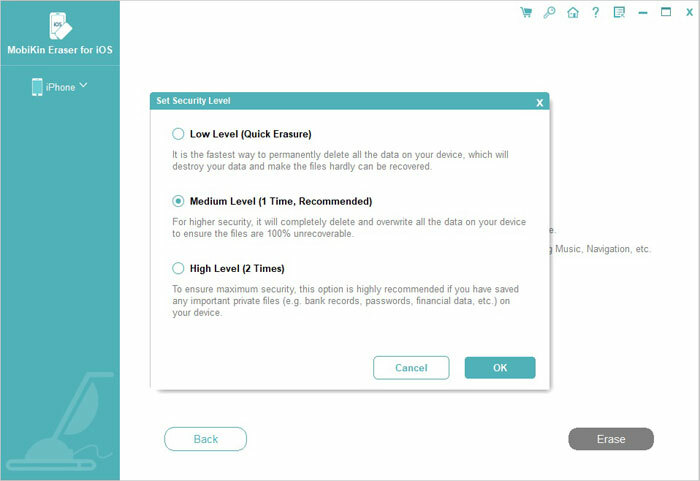 By doing this, you will be confirming your action, and the program will automatically begin erasing the data permanently. Please do not plug out your device during the erasing process. The above are some of the methods that you can use to free up space on 16GB iPhone. Nobody likes to deal with phone storage issues or keep deleting their photos and apps every now and then. However, sometimes we have no other options but to reclaim some space on the iPhone. To free up the storage space on 16GB iPhone, we kindly suggest you have a try with the MobiKin Eraser for iOS, which is really an easy to use yet powerful tool to erase your iPhone data completely and permanently.